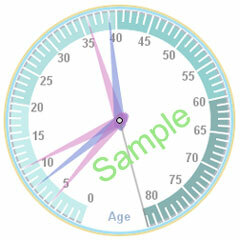 Generate your family's age clock now, plus fast foward into the future, and watch your family growing up! For each family member, enter name or nickname, current age as of today, and, optionally, gender. Gender is used in combination with country (if specified) to determine life expectancy. If country is specified, but a given family member's gender is not, the average life expectancy in that country is used. If country is omitted, the default life expectancy of 80 years is used for everyone. Premature Baby Corrected Age Calculator - Calculates chronological and adjusted age for preterm babies. Age Calculator - Calculate your age down to the second! Calendar Maker - Ages anyone daily on a monthly calendar. Add photo!